Overnight oats and jamun (Indian Blackcurrant/ Black Plum) base topped with plethora of fruits and seeds. A nutritional powerhouse of a breakfast that pleases the eye too! 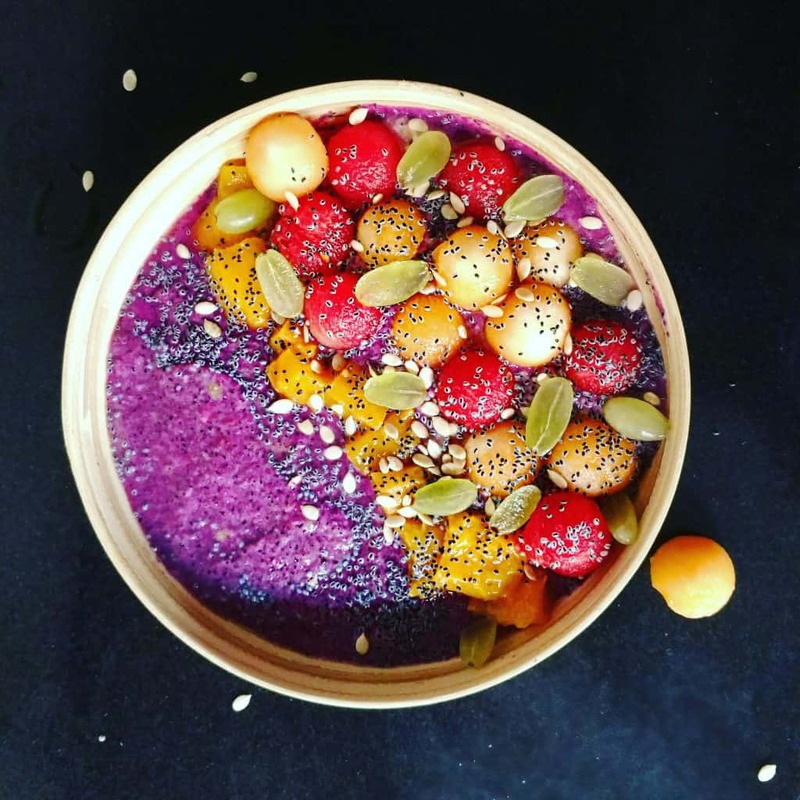 Smoothie bowls are a great way to match your macronutrients and micronutrients requirements for the day – another major reason I’m so in love with them. Balance the macros and micros well, and you get to realize all your fitness and weight-loss dreams, one meal a time. This recipe is a re-worked version of my previous Jamun Banana Millet Muesli Smoothie Bowl, wherein I’ve changed the base ingredients and toppings slightly. Jamun or Indian blackcurrants are one of my favorite seasonal fruits, and what better way to make the most of these purple beauties than use them in a smoothie base. Jamun is a low-calorie (carbohydrates – 14gm), low- Glycemic Index fruit, thus allowing the usage of plenty other carb-rich fruits with higher natural sugar content like mangoes and bananas. I’ve balanced the calories out by using other low-calorie fruits like watermelon and cantaloupe (muskmelon). Blend frozen Jamun to a smooth consistency. Add overnight/ cooked oats to the Jamun puree and whisk well to smooth consistency. Divide into 3 bowls (I used the scooped watermelon half as a bowl) . Top with fruit slices and balls and seeds. For de-seeding or pitting the Jamun fruits, remove the skin and pulp in small sections with a paring knife and force the seed out. Be careful not to scrape the seed, as it will render a bitter taste to the puree. Freeze after pitting. This recipe has a considerable amount of sugars because of the inclusion of sugary fruits like grapes and mangoes. Do mind the sugars consumed for the rest of your meals accordingly. Alternatively, skip one of the sugary fruits and include just cantaloupe and watermelon to keep the calorie and sugar-content low.